Former World Championship leader Kenneth Bjerre is on his way back to Peterborough Panthers as part of promoter Ged Rathbone’s ruthless revamp. 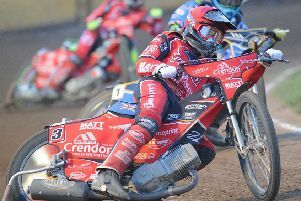 The Danish star, a fine club servant for seven seasons during the Elite League era, has now returned to throw his weight behind their bid for Premier League success in 2016. The captures of Bjerre and 2006 title hero Richard Hall, both 32, were announced by the club earlier this afternoon (August 27). They came less than 24 hours after Rathbone took the bold step of announcing two other team changes during the interval of a 54-38 home drubbing at the hands of play-off rivals Newcastle last night. The spectacular rebuilding job of a faltering city team began when Anders Thomsen and Danny Halsey were drafted in for out-of-form Tom Perry and Emil Grondal. Those two changes take effect immediately with the newcomers entering the fray when Panthers host Redcar in a must-win Bank Holiday Monday showdown at Alwalton (7pm). That meeting will now provide Panthers farewells for Nikolaj Busk Jakobsen and Ashley Morris after they were axed to accommodate the eyebrow-raising signing of Bjerre and Hall, who will both arrive ahead of a Sunday, September 4 home double-header against Rye House and Workington. Rathbone said: “I publicly promised the supporters I would not let them down – and I believe I have again been true to my word. “The fans made it clear that they wanted to see changes made, but it was not something we could simply rush into. “We had to bring in the right riders and there is no doubt in my mind we have done that. “I’m absolutely delighted that a rider of Kenneth’s calibre was prepared to come into the Premier League to help us out in our hour of need. “His arrival is right up there with our capture of Craig Cook as the signing of the season at this level. “He could not possibly be any keener to help us out of the tough situation we currently find ourselves in, and it’s also good to be able to bring in another rider in Richard, who Peterborough fans hold in high regard. “He’s on an absolute steal of an average as far as I’m concerned, and the chance to race at the Showground might just be the shot in the arm he needs. “For much of the year we have looked to be nailed on for a play-off spot, but our form has nosedived badly and we now need to pull out all the stops to make sure we stay in the top six. “We have to start giving our fans what they want - and what I demand – and that is a winning team. Bjerre has not raced in England so far this year, but has enjoyed a fine campaign in the ultra-tough Polish top-flight as well as earning a tilt at qualification for the World Championship. Hall has been out of the sport since being released by Sheffield earlier this season, but he is affectionately remembered in this part of the world for his part in the Elite League championship triumph a decade ago. Of the latest departures, Busk Jakobsen can have few complaints after failing to boost his average in the way club bosses hoped, but Morris can be considered very unlucky to be a victim of the numbers game. The British talent has been a pleasing performer since arriving in early July, and Rathbone has insisted the 22 year-old will be in the club’s plans for 2017. The new Panthers team is Craig Cook (av 9.96), Kenneth Bjerre (8.22), Ulrich Ostergaard (8.08), Anders Thomsen (6.62), Richard Hall (3.29), Zdenek Holub (3.00), Danny Halsey (3.00).